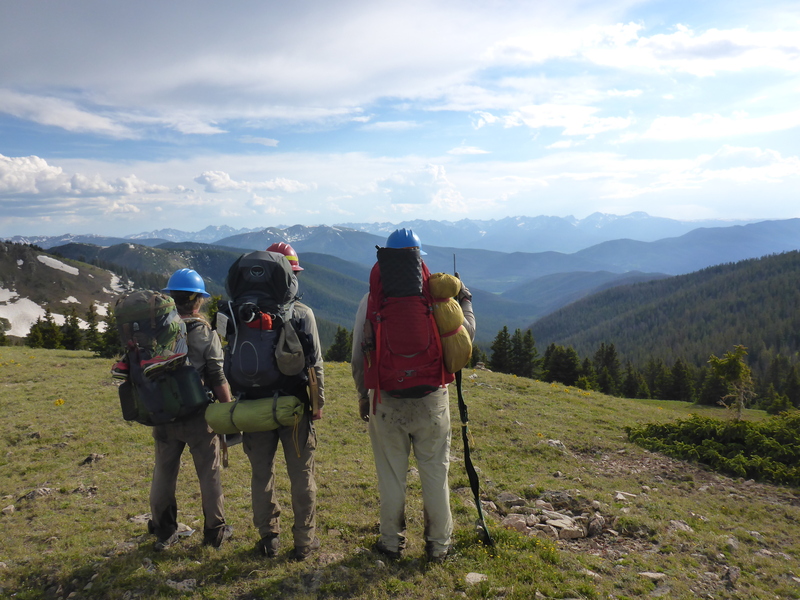 After the holiday weekend, its time to take a look back at Rocky Mountain Conservancy – Conservation Corps’ fifth week in the field and first week returning to their work locations after midweek. Shelby prepares some food at a backcountry campsite. 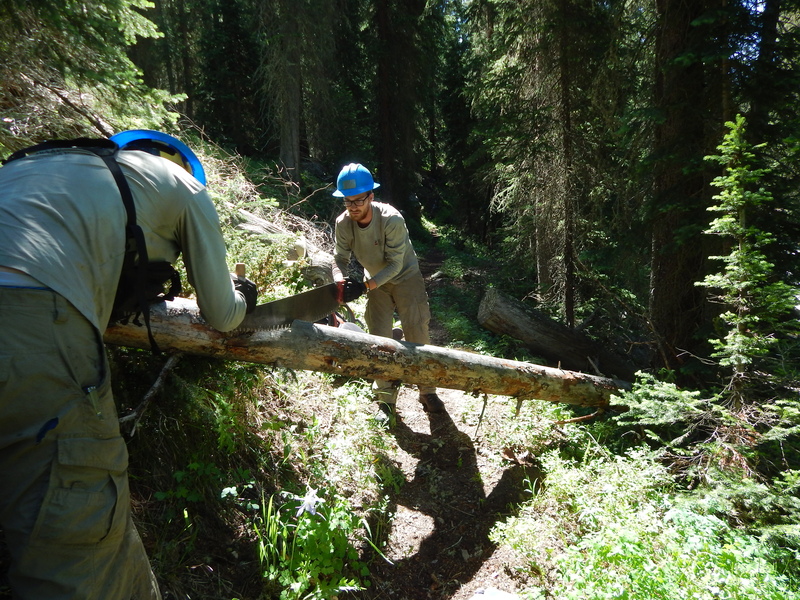 The trail work consisted of clearing over 80 trees off the Kinney Creek, Keyser Creek, St. Louis Divide, and Bottle Peak trails with crosscut saws and patrolling the trails to ensure that the public was obeying the laws of the wilderness. Tommy works with a USFS trails member on a cross cut while Shelby uses a silky saw to limb a tree. 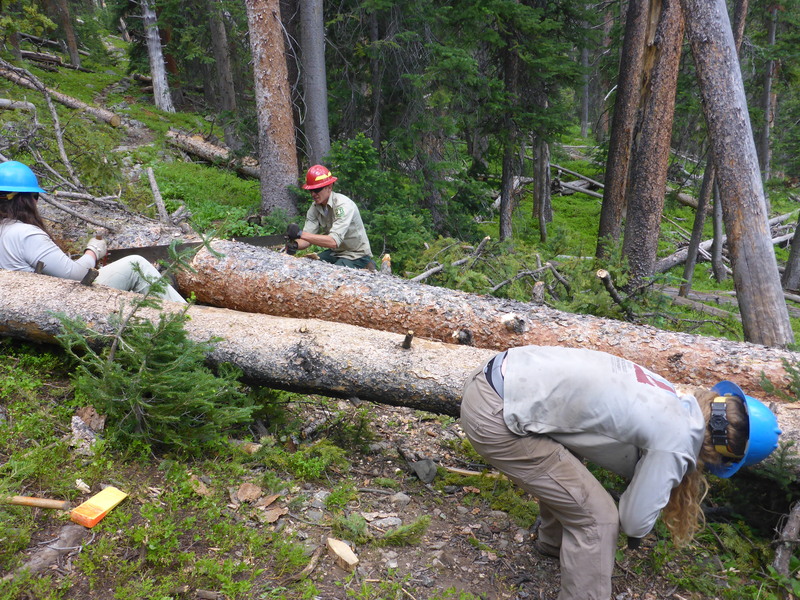 Josia, Aidan, and Lewis spent four days working on the Caribou and Arapaho Pass trails, clearing over 150 downed trees and making 93 drainages. They spent a significant amount of time clearing an avalanche site on the Arapaho Pass trail. Aidan and Lewis clear a tree from the trail using a crosscut. Both backcountry crews returned home with a newfound appreciation for the wilderness areas in the Sulphur Ranger District. It was a special experience to live on the trail for four days, free of internet and running water, with nothing but the wilderness and your fellow crew members to keep you entertained. This week, the Red Feather Crew spent another week of working independently from our Forest Service coworkers and the Larimer County Conservation Corps Crews. We spent the week focusing our energy on the Bulwark Ridge Trail, which leads up to Signal Mountain and is located in the Comanche Peak Wilderness Area, which also meant a lot of travel time for us to and from the work site each day. After midweek, we had two more “Wait, wait… Don’t Tell Me!” episodes saved up to keep us laughing and awake during the long car rides. However, when people don’t stay awake in the truck… they end up with a stealthily taken picture of them passed out on a fellow crew member’s phone. It’s simply become a crew tradition at this point. We also had our crew evaluations from midweek fresh in our heads, and started out the week determined to use the constructive feedback we had received to grow and improve as individual members and as a collective crew. For the first three days of the work week, we made our way up the trail from the Dunraven Trailhead. We split into two groups of three each day, sending one group up ahead with the saws to buck out any trees they found across the trail, while the other crew would follow more slowly and focus on tread work such as cleaning out and digging drainage structures, and filling in some of the many trenched out areas along the trail to make it more walkable for hikers. We also brushed in the occasional social trail, and lopped/removed any stray foliage or small logs inhibiting the trail corridor. After three days we had worked our way up and down the entire stretch of trail, which is almost 12 miles round-trip, so it was time to move on. On Thursday, we hiked up a conjoining trail to the Bulwark Ridge Trail instead, starting at a Trailhead in the Pingree Park area. We kept with the same system of splitting into two groups, and the tread crew dug around 27 drains while saw crew bucked out an enormous tree towards the very top of the trail. During the week, we also celebrated the last of the summer birthdays in our crew, as Mary turned 19 on Tuesday, July 1st. Her choice for her birthday dinner was Lulu’s, a lovely Asian restaurant in Old Town where we enjoyed sushi and fried rice, along with a free bowl of green tea ice cream for the birthday girl. For the weekend, many crew members had their own Fourth of July plans, but a few of us went to watch the City Park fireworks show, which had an incredible turnout and was a really fun experience. We all can hardly believe this was the end of our 7th week here! We only have 3 more work weeks to go, but the time has just seemed to fly by as we have all grown closer as a crew. Can’t wait to see what our last few weeks together will bring! The Estes Crew spent the week with the R0 evegetation crew. The majority of the our time was spent planting just off the side of the road at Moraine Park. We planted a variety of small shrubs and grasses on a small patch of land that was reduced of vegetation after road construction. We spent about two full days planting around 1,500 plants. We also spent a fair amount of time watering most of the sides of Bear Lake Road. A few of our mornings were spent placing steven’s logs (logs on road sides to keep people from pulling off on vegetation) on the side of the roads. Sadly these are being removed because head NPS administration changed their minds and did not want them there after all. On Thursday we had some excitement when the crew spotted a lightening strike, which drew smoke immediately. We were able to report the smoke in Moraine Park and fire crews confirmed there was a fire and jumped into action. 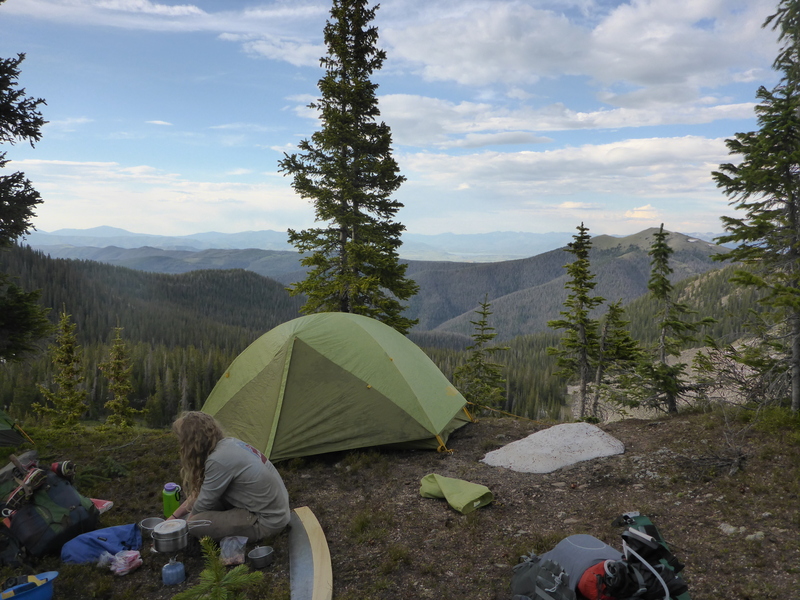 The Rawah Crew spent the week in the Northern Rawah Wilderness Area. After forty miles of hiking and three nights in the backcountry, the crew completed over 100 log outs and successfully cleared the McIntyre, McIntyre Creek, and Medicine Bow Trails, even opening a section of the Medicine Bow Trail that had been closed due to damage. On Thursday we did something a little different because all of the park employees had the day off, we completed an opening run up to the beautiful Sky Pond, where you have to climb up and through a waterfall. 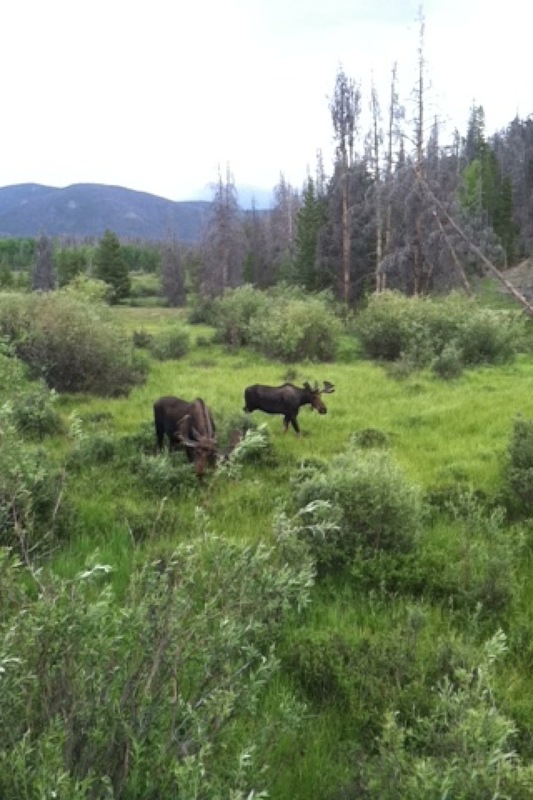 For the Fourth of July weekend some of us headed over to the west side of the the park for fireworks and to sped time in Grand Lake and ended up seeing a dozen moose.